39% of students surveyed have taken a course without the required materials because they’re too expensive. 60% of them think they would have performed better if they’d had the materials. 44% hardly or never purchase from the on campus bookstore. 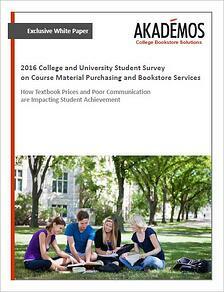 In addition, the white paper delivers actionable recommendations administrators and campus shop operators can use to reduce textbook costs, improve student satisfaction with bookstore services and increase bookstore sales.